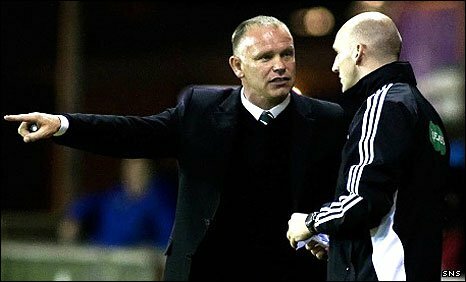 Two Scottish Premier League managers have backed under-fire Hibernian counterpart John Hughes to be a success at the Easter Road club. Jim Jefferies, in charge at capital rivals Hearts, described Hughes as the "most determined character" he had met. And former Hibs boss Mixu Paatelainen, whose Kilmarnock side knocked Hughes' men out of the Co-operative Insurance Cup, said the criticism was unfair. The Finn said: "They have had a sticky start, but there's a long way to go." With only four wins in their last 26 matches, Hughes and his players are struggling for confidence and form, and sections of the club's support have booed the team. After Wednesday's 3-1 defeat by Killie, Hughes told BBC Scotland: "We are just not carrying any luck and we just need to get that win and, if we do and go on a wee run, the media will jump on to someone else." His positive outlook would not surprise his former manager at Falkirk, Jefferies, who has no doubts that he will be able to turn the club's fortunes around. 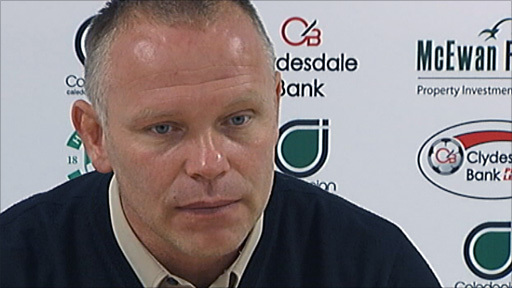 "John Hughes is the most determined character I've ever come across," said the Tynecastle manager. "I've known him a long time. When I brought him to Falkirk he wasn't that popular and he won them (the fans) over through sheer determination and that is his biggest strength. "When it comes to a test of character, there isn't anyone with more than Yogi. "Confidence is a big thing in any sport and right now their confidence is a bit low. "They are wanting the win badly at Easter Road to get them up and running and I'm sure they'll get through it." Of their opening five Scottish Premier League matches, Hibernian have won one, drawn two and lost two. They sit in mid-table, a point behind Kilmarnock. Perhaps it is not too surprising, then, that Paatelainen has sympathy for Hughes. The Finn, who recently spent a season and a half in the dugout at Leith, said: "Yogi (Hughes) is a very positive, whole-hearted guy and somebody who is very likeable. "It is unfair, I believe, to him because last season he did fantastically well. He guided the team to Europe. "People are far too ready to criticise and start calling for heads. Yogi will do a good job and I'm hoping that he will turn things round." Hibs' European adventure was limited to two matches against the Slovenians MK Maribor, which resulted in defeats home and away in the Europa League qualifiers. Paatelainen is beginning to see results go his way with Kilmarnock. After losing their first two league matches, the Ayrshire side have enjoyed progress in the Co-operative Insurance Cup and have beaten St Mirren and Aberdeen in the SPL. "I am a strong believer that performances give you results," he said. "Of course, sometimes you don't play well and you win and it's very welcome. "But if you keep making the right passes and the right moves, that will give you results." Hughes, no doubt, will be imparting similar wisdom to his players.